Neil Pinkett was born in St Just-in-Penwith in 1958 and spent his childhood in West Cornwall. After a successful career as an illustrator spanning 20 years, Neil decided to dedicate himself to painting full-time in the mid-1990s. An acclaimed solo show followed almost immediately, and since that time, Neil has built a reputation as one of the foremost landscape painters in the county. Today, Neil divides his time between Bath and Cornwall, spending the summer months living in his studio in Marazion, overlooking St Michael's Mount. 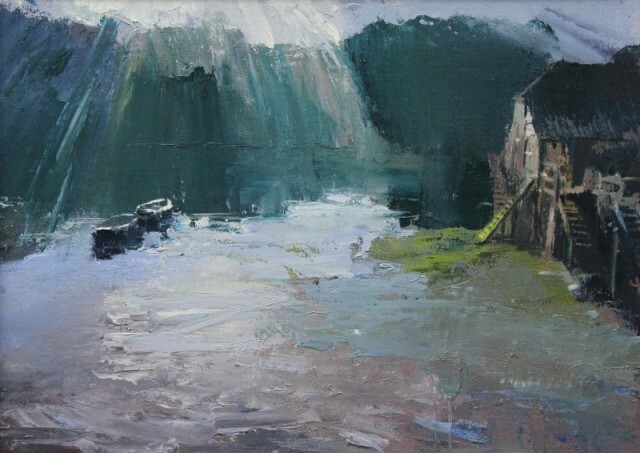 Neil is one of several en plein air painters to emerge from St Just in recent years, the most prominent of whom is Kurt Jackson. Neil does most of his work on location, occasionally from his canoe using a specially adapted easel and accompanied by his dog, Beavis. Neil Pinkett travels widely - landscapes and landmarks from these journeys feature heavily in his work. Recent projects have included a series of paintings of bridges from around the UK and another on the Scillonian ferry that operates out of Penzance harbour. Neil works mainly in oil paints, texture and overpainting being used to create impressions of atmosphere and light. Neil's work has been shown and collected across the UK. He has also undertaken painting tours and one-man shows across America.